Many people have enjoyed the delicious Bang Bang Shrimp from Bonefish Grill. Perfectly crispy shrimp are coated in a creamy sweet Thai chili sauce. It is crunchy, sweet, and creamy all at the same time. It's the perfect bite! The restaurant's recipe is very high in calories, but this copycat recipe has far less calories and fat as we're substituting most of the mayonnaise with nonfat greek yogurt and cooking the shrimp in far less oil. 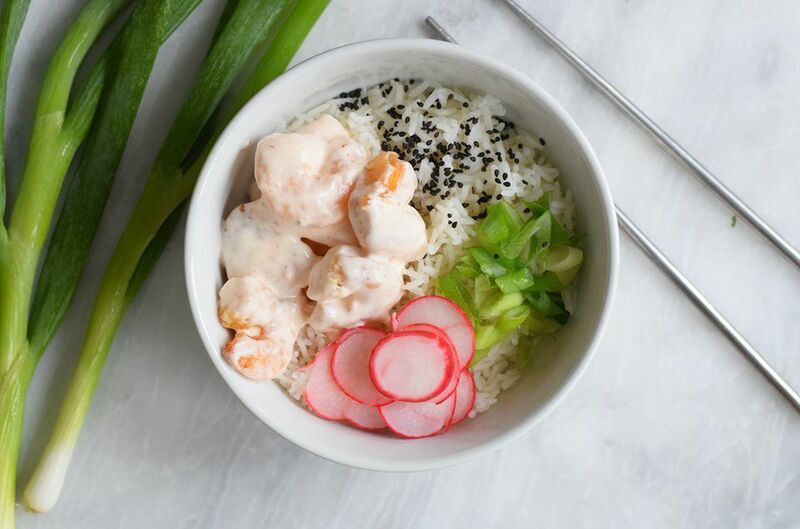 We served these shrimp in a rice bowl with scallions, pickled radish, and sesame seeds, but you can eat them on their own as an appetizer, on top of a salad, or even stir-fried noodles. But don't say we didn't warn you...they are super addictive! This dish can easily become a weekday favorite or your go-to party appetizer. You can easily replace the shrimp with chicken if you don't eat shellfish. Just cut up chicken breast into one inch chunks and follow the same steps! Prepare the white or brown rice ahead of time. If you have a rice cooker, use the keep warm setting when it is done cooking. If you are using a stove top, start making the rice five or ten minutes before you start the rest of the cooking. Whisk together the vinegar, sugar, and water in a saucepan on medium heat until the sugar dissolves. Remove the vinegar mixture from the heat and pour it over the sliced radishes and place in a covered container in the refrigerator while you finish cooking the shrimp. You can also make this up to a week in advance. The flavor will intensify the longer it has to soak. Toss the shrimp (tails off) in the corn starch until completely coated. Then shake the excess corn starch off of the shrimp and set them on a plate while you prepare the sauce. Whisk together the greek yogurt, mayonnaise, chili sauce and Sriracha in a medium sized mixing bowl and set aside while you cook the shrimp. Heat a non-stick skillet (a regular skillet will work as well) on medium heat and coat generously with cooking spray (a tablespoon of vegetable oil will also work). Place the shrimp in the hot pan and cook for 2 minutes per side or until cooked through and crisp. If you aren't concerned with calories you can also deep fry them in a deep fryer. Toss the shrimp in the chili mayonnaise sauce and serve it immediately on top of the hot cooked rice. Top with the drained pickled radishes, scallions, and sesame seeds.